UBC Digital Tattoo: Connect: Social Media video featuring the good, the bad and the ugly of how to present yourself online by looking at some common “types” found in social media. Beginning in Grade 4 and continuing until Grade 9 the draft BC curriculum states that students will know and understand the “Safe use of the internet and social media”. 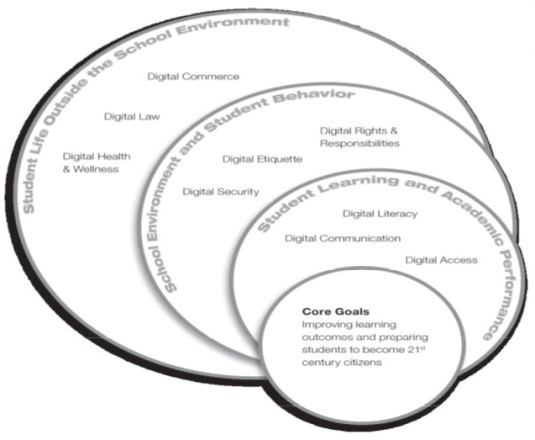 Dr. Jason Ohler, professor at University of Alaska Southeast, facilitated a Massive Open Online Course (MOOC) on digital citizenship as an extension to his book Digital Community, Digital Citizen (Ohler, 2010). Created by the Office of the Privacy Commissioner of Canada Youth Privacy focusses on youth awareness and education about privacy and technology use and provides Powerpoint presentations (with speaker’s notes for teachers of students from grade 4 to 12) to help teachers teach students how technology affects privacy and how students can secure their online identity. This website is created by the Canadian Office of the Privacy Commission of Canada, Youth Privacy department. Graphic novels are designed in PDF version, or HTML version along with a discussion guide to help youth navigate online privacy risks. The site can be searched by grade level, topic and province to identify relevant units and lesson plans. This Canadian non-profit society’s website provides many resources including a tip line for online safety, Kids in the Know, a child abuse prevention program and other resources for teachers and parents. This site provides step by step instructions for kids who want to have images removed from Facebook, Instagram, etc. The Canadian Centre for Child Protection is committed to helping parents, teachers and members of the public better understand the web. The website aims to help keep kids safe as they explore and enjoy the online world. SafeOnline’s vision is to help current and future generations to be informed and responsible users of digital technology. This BC-based non-profit society offers teacher training and school presentations regarding the internet, cyber-bullying, and online safety. Developed by students with the support of the University of British Columbia, this website aims to raise awareness about how students can protect their digital identities, connect safely and effectively online and use the internet in their academic lives to inform the impact of their online activity on their careers. This non‐profit provides independent reviews of movies, games, apps and websites and also suggests those best for learning and most appropriate for various ages. The educational resources include K to 12 curricula, professional development, scope and sequences and strategies for engaging parents. This documentary investigates the implications of living in a world consumed by technology and the impact that this constant connectivity may have on future generations. This comprehensive website is based on the work of the American researcher, Dr. Sameer Hinduja and provides many printable “tip” pages to prevent and respond to bullying. This website, hosted by the National Institute for Missing and Exploited Children, provides resources that enable children to learn about safety on and offline. Entertaining, educational videos, games, activities and presentations enable children to learn about potential internet risks and how to protect themselves from exploitation. The British website Digizen, encourages us to be responsible Digital Citizens by providing resources, games, and films on topics such as social networking and cyber bullying for teachers, parents and children.